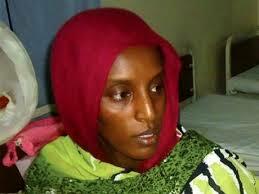 Meriam Ibrahim is back in prison after one day of freedom. Obama refuses to help her. Yesterday, Christians were rejoicing that Meriam Ibrahim and her children had been released from a Sudan prison after all charges were dropped against her. Their freedom was short-lived, however. Sudanese officials have rearrested her. At this point it is unclear why she was re-arrested. Congressmen Trent Franks (R-AZ) and Frank Wolf (R-VA) were the men who have spearheaded the effort in Congress to obtain freedom for Meriam Ibrahim from a Sudanese jail. Thanks to their work, 38 Congressman sent a letter of concern to Secretary of John Kerry on the plight of Meriam and her two children who were in prison. She faced 100 lashes and then death by hanging for her Christian faith. Interestingly enough, only seven Democrats signed this letter of concern – showing just how little liberals care about religious persecution overseas. Perhaps if Meriam had been a lesbian Muslim, more Democrats would have signed the letter. And, of course, the Obama Administration couldn’t find time to put pressure on Sudan for her release and issued a lip-wristed statement on June 12. Issuing a bland statement or holding up a twitter hashtag sign isn’t an effective way of getting someone freed from an Islamic prison. Instead, Congressman like Franks and Wolf, plus the Religious Freedom Coalition and other pro-religious freedom organizations were responsible for getting her released from prison and a cruel death sentence. Tony Perkins with the Family Research Council was on “The Kelly File” last night to discuss the release of Meriam Ibrahim. Perkins was upbeat about her release yesterday, but she now faces an uncertain future once again. What sort of message would it send to the rest of the oppressed, persecuted, abused, beaten, ashamed, disfigured, tormented, shunned, disowned, discarded, raped, underage, muslim women if just one was to be set free for marrying to / converting to Christianity for a better life!